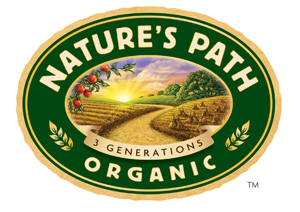 Nature’s Path Coconut & Cashew Butter is a deliciously organic breakfast to nourish you and your family. 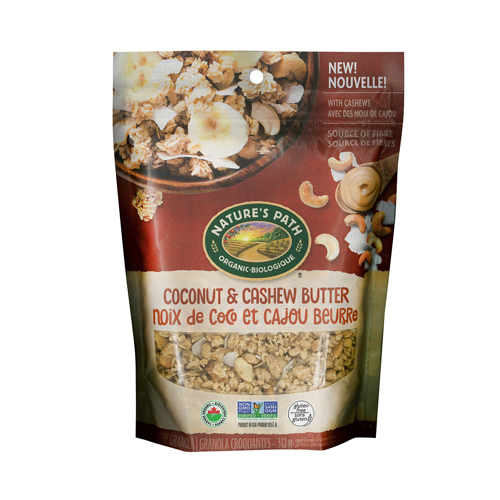 With crunchy clusters of gluten free whole-grain rolled oats, creamy cashew butter, potassium-filled cashews and fiber-filled coconut chunks. Serve up your granola with milk or yogurt and a little fresh fruit or simply snack straight from the bag. rolled oats*, evaporated cane juice*, sunflower oil*, yogurt chips* (sugar*, palm kernel oil*, non-fat milk powder*, lactic acid, soy lecithin*, salt, vanilla*), rice starch*, freeze-dried blueberries*, freeze-dried berry blend* (freeze-dried strawberries*, freeze-dried raspberries*), sea salt, natural flavor, tocopherols (Vitamin E). *Organic. Contains soy and dairy. Produced in a facility that uses tree nuts and peanuts. Vegetarian.